We are happy to announce the official release of the new full-length Defenders of the Faith, was released on November 5th, 2013 on Trendency Records and Camp 8. The album's title refers to the group's commitment to defend and promote their faith in the midst of the ever-increasing darkness in our world. The album is undeniably a return to form for the legendary hip-hop group that many consider to be the "godfathers" of gospel rap. In fact, many of today's top Christian rappers are on record as stating they are Christians and/or pursuing their artistry today as a direct result of the group's music. With fourteen incredibly solid tracks including the first single "Walk With Me," the Gospel Gangstaz have a healthy complement of tracks to choose from for future singles. The single was released digitally October 8th with two distinctly different covers to choose from. 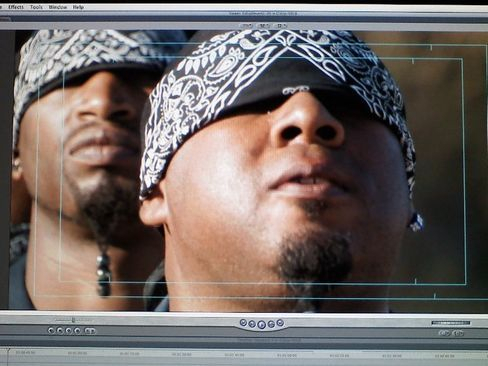 On the heels of a historic career including Grammy and Dove Award nominations as well as record sales in the hundred of thousands, the west coast-infused flavor of the Gospel Gangstaz is once again ready for prime time. Defenders of the Faith features high profile guest appearances ranging from the multi-platinum gospel duo Trin-i-tee 5:7 to the legendary bassist Bootsy Collins (who rose to fame as a member of James Brown's band and later Parliament-Funkadelic) and his elder brother, Catfish. With veteran radio promoter Kendall Duffie of D3 Entertainment on board for the life of the project, a full court press is now underway to reintroduce the group to old fans as well as a new generation of gospel rap fans who might never have heard the group. both Christian and secular alike. Their music can stand up against virtually any other music topping the charts. Trendency Records' President David C. Coleman states, " It's truly an honor to be working with the Gospel Gangstaz. They have a clear vision of how their gifts can be used to follow the example of Jesus Christ and take this revolutionary message of love and redemption to the streets. These are genuine men of God who aren't afraid to challenge some of the conventional perceptions regarding the proper way to reach those in need. Our goal at Trendency Records is to bypass much of the noise that surrounds these discussions and allow our artists to get out into their communities and reach those who might never have the oppertunity or desire to step foot in a church. We believe segregating ourselves behind church walls is counter-productive in achieving the Great Commission."